In the world of little children, training wheels are the rubber underwear of sports equipment--one didn't really think about them until another child started to point and laugh, and once he did, all one wants to do is take them off. As any parent knows, pulling the training wheels off a bike can be a scary and painful learning process--for both the child and the parent. Much to the glee of children and parents everywhere, the Gyrowheel gets rid of the training wheels altogether. 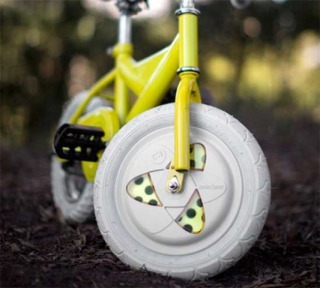 By using an electric spinning disc inside the wheel, the Gyrowheel is self-stabilizing and automatically readjusts the center of balance of the bike when your child wobbles. So you're free to let your child roam the driveway on two wheels and your child can learn to ride without the stigma of training wheels. The wheel includes a rechargeable battery and indicator light. It gets close to three hours of run time when set on high stability (there are three stability levels). It pumps up like a regular tire and will be available in 12 and 16 inch sizes. The 12-inch Gyrowheel will be available in December for a retail around $100 and the 16-inch will be ready for spring. The company also mentions plans for adult models. A DIY Lab On A Chip: But When?